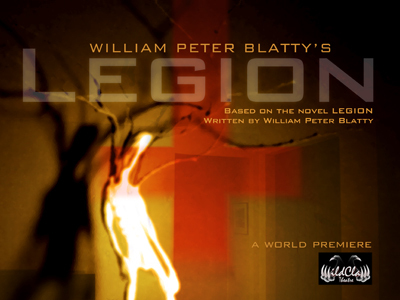 Last week I went to see the WildClaw Theatre’s new play Legion, and it was ridiculously awesome. It doesn’t have zombies in it per se, but if you’re a horror fan in driving-distance of Chicago, you’d be crazy not to come check it out. It is set in San Francisco in the 1980’s, and there are many awesome period-touches, from Walkmans to women’s hairstyles. It’s very scary, and there are enough grizzly images that even a veteran horror fan ought to be sated. It can also be very funny in places, and the laughs help break the pervading horror-tension that runs throughout. The script is great, and the special effects are good, but the best part of Legion is the performances. The actor who plays Kinderman is awesome as a grizzled, veteran detective, and most of the supporting characters are just as good. As I watched the play, I found myself time and again thinking: “Man, just write a whole play about that guy. He’s awesome.” The actors are great both at playing someone who is terrifying and someone who is terrified. In all seriousness, if you like horror, you owe it to yourself to check out this play. It runs through April 18 at the Viaduct. Here is a link to the details.